We can provide church sign of all kinds. 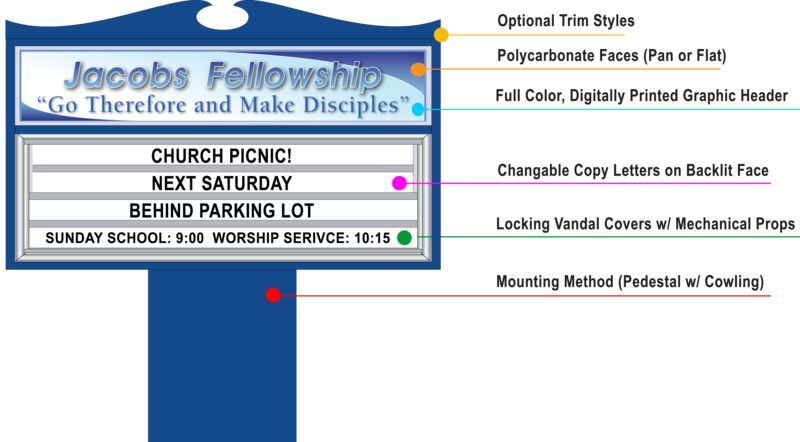 No matter the size of the church or the sign, our team can meet the needs of your congregation! Our signs come with peace of mind! Church sign cabinets are made of extruded aluminum and polycarbonate for long lasting durability and quality appearance. Our lighted signs are durable, energy efficient and will never rust.Turn-key church signage means we offer locking vandal covers, 120-150 mph wind load warranties, performance guarantee on your vinyl graphics and a standard set of 300 Pronto quick-change letter cards. (More quantities and options available! )Your completed sign will be installed and hard-wired by a local technician, and if you haven’t found that person, we can help with that too! The information below can help you narrow down your choices to get a quote on the sign you want.